Read about - Goondiwindi Holiday Park below. This is a very welcoming park and our choice when we called into Goondiwindi for a few days during our last trip through Queensland. It has lovely drive through sites that are suitable for large rigs and motor homes. Each of the sites in the centre of the park were separated by trees or palms which provide shade. 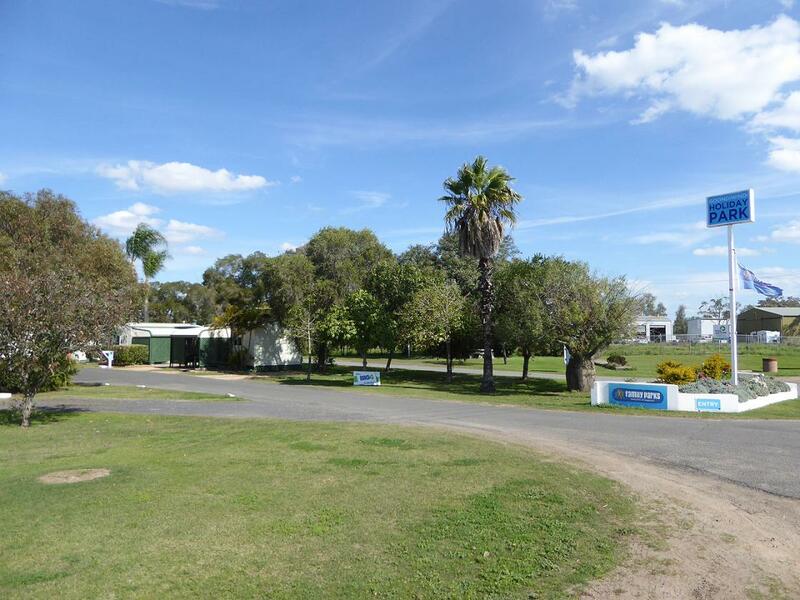 One and two bedroom cabins are provided at Goondiwindi Holiday Park with lovely gardens around those near the entrance. There are several amenities including some unisex bathrooms with a toilet and shower in the same room. Unisex bathrooms are great and I understand very useful for those travelling with partners who need assistance in the shower. Keys are required for the amenities. Don’t be put off staying at this park if the train goes by while you are looking around or checking in – it only passes once a day. The caravan park has an artesian pool and spa with the water trucked in and kept at about 37 degrees for comfort of visitors. This park is pet friendly and has a country style camp kitchen located near the pool. There are barbeque facilities available and a dump point with a pull off area so you can stop and empty the toilet on the way out without blocking the road. Sausage sizzle was held at the caravan park on Wednesday night around a campfire pit. All guests are invited and asked to donate a gold coin to the RFDS. You can enjoy a sausage (beautiful and purchased form the local Foodworks), bread, onions, and sauce. This was a great opportunity to meet other guests - we thoroughly enjoyed chatting to the staff and meeting fellow caravanners. My star rating for this park also includes the welcoming friendly greeting on arrival. have you been to Goondiwindi Holiday Park? Explore Goondiwindi Holiday Park with RvTrips and find out where to stay, what to do and what to see. Helping caravan, motorhome and camper owners have a great holiday.